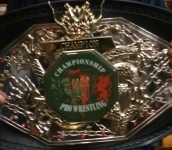 126f Heavyweight Master Championship was created by 126f Pro Wrestling. Being a veteran luchador with at least 10 years of in ring experience. All competitors for the inaugural match had at least 15 years of in ring experience. In order to determine the inaugural champion there was a seven man elimination match. 1 The Rocker Cien Caras Jr.
2 Luminoso Cien Caras Jr.
5 Rey Cobra Cien Caras Jr.
1 Mr. Tempest (90s) Cien Caras Jr. This page was last edited on 6 August 2018, at 09:23.